1. 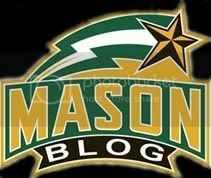 George Mason - The Patriots have this spot at the moment but won't keep it for long if they continue to have games like they did against Northeastern. They looked much better at William & Mary over the weekend but the thought of them running away with the CAA title seems a bit far-fetched at this point. 2. Delaware - Lately the Blue Hens have been playing better and they have two all-conference starters in the lineup, Jamelle Hagins and Devon Saddler. Hagins leads the nation in rebounding (12.7 RPG) and the squad has recently won three straight. In their only conference game so far they pummeled ODU and got to the line all night long. Jarvis Threatt had 19 points, all of which came from the free-throw line. They are one of the more balanced teams in the conference. 3. Northeastern - Their 2-0 in conference play and took care of George Mason will ease. I'm not sure if they can keep this up but you have to wonder what their record would be so far if they had had Jonathan Lee all season long. 4. Towson - Leave it to Towson to follow up one of the worst season's in college basketball by doing decent in a year when they can't win the CAA autobid. They are 7-8 and are 2-0 in the CAA. The win at Drexel was impressive and Jerrelle Benimon is an emerging star. They will continue to hand out "upsets" this season. 5. Drexel - They have been the most disappointing team in the league outside of Old Dominion but lately they seem to have found their stride. Losing Chris Fouch has hurt them and Frantz Massenat hasn't been playing like a CAA POY. They have looked awful at times but pounded Georgia State in Atlanta last week. 6. William & Mary - Their soft non-conference schedule might bite them in the behind. They lately haven't looked as good as their record would indicate and turned over the ball a ton against George Mason last weekend. They have some talent but will struggle against the CAA on the boards and on defense. 7. James Madison - They are hurting without senior Andrey Semenov and just lost to Hampton. Semenov is out with an ankle sprain and the Dukes could tumble in the CAA standings. They still have a decent one-two punch with Devon Moore and Rayshawn Goins but don't have much outside of that combo. They've have real troubles on defense this year. 8. Georgia State - The Panthers just lost to Hofstra but showed off their hot shooting against James Madison. They lack a true inside game and it has hurt them. They have a tendency to go cold from the outside and can't rebound well at all. 9. UNC-Wilmington - Keith Rendleman is a double-double machine but the 'Hawks struggle on defense. They are a young team that has also had trouble holding onto the ball. 10. Old Dominion - Easily the most disappointing team in the conference. They have two wins and one is actually against UVA. I didn't think they would be like Blaine Taylor's teams of the past this year but also didn't they would be this poor defensively. They can't make shots and they can't seem to stop other teams from making shots. It's really just that simple. With DeShawn Painter they have a go-to option on offense but have nothing else outside of him. 11. Hofstra - The Pride lost a lot due to suspensions and they will struggle during CAA play. They are one of the worst shooting teams in the country and don't have many experienced scorers on the roster. Depth will be an issue this year and they will need a few guys to play over their heads this season in order to stay out of the conference basement. Seeing that they took care of Drexel in their gym, NE is looking more and more like a team to be reckoned with. Strange goings on in the CAA when the big game this weekend is between unbeatens NE and Towson! If NE wins and then wins in Delaware the weekend after, I think we'll have to surrender our top ranking to them ... just in time for our rematch with them the weekend after.